You may have heard about Inbound Marketing, but want to know if it’s right for you. The short answer is yes, of course! But, what does that really mean? What is the value, or ROI, to your company of implementing an inbound marketing strategy? To help our clients “monetize” their investment, and fully understand the benefits to them, we’ve developed a 4 step process to help gain insight into the value that inbound marketing can bring to your organization. The first step? Determine the life-time value of a customer. This equates to the total average profitably over the lifetime of the customer. This key data point helps you understand the business results of the strategies and tactics implemented. The second step is to identify what you are currently spending on marketing to gain each new customer or Marketing Cost of Customer Acquisition (Marketing COCA). This is accomplished by obtaining the fully loaded annual salaries of your marketing team, annual spend by your marketing team, and number of customers acquired annually. Marketing COCA’s above $5,000 are good initial indications that Inbound Marketing can work for you. 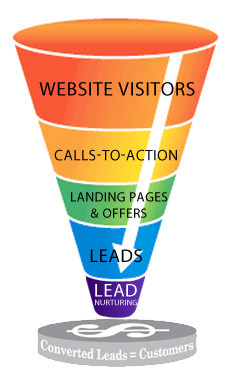 The third step is analyzing your website funnel. This is done by first capturing the total site traffic, lead conversion and sales conversion for a given month. From this you can calculate the lead conversion rate (leads/traffic) and sales conversion rate (sales/leads). 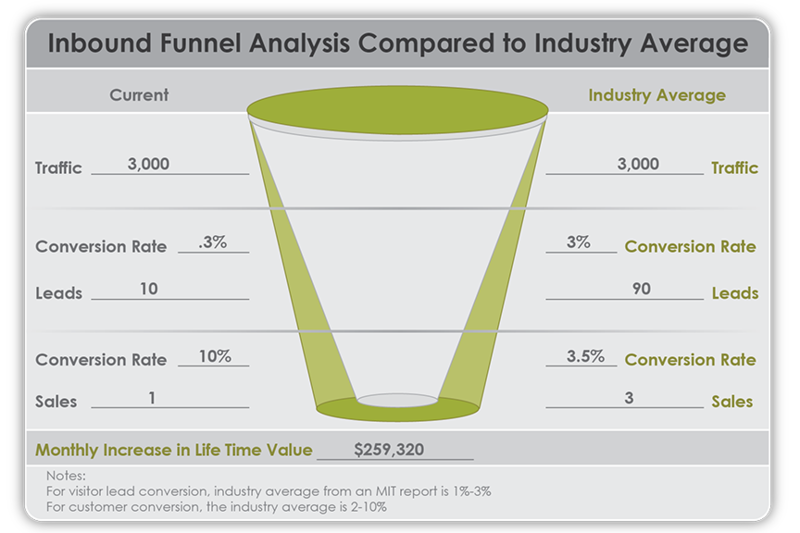 Finally you can compare the rates to the industry averages of 1-3% for lead conversion and 2-10% for customer conversion. Conversion rates under industry averages are another good indication that Inbound Marketing can be good for your business. The fourth and final step is taking the number of new customers gained by reaching the industry benchmarks, and multiplying it by the Lifetime value of the customer. This value will provide an estimate for the monthly increase in life-time value of customers. If this increase is at or above your current business goals, more than likely Inbound Marketing can work for you.